A total of around 250 Mountain Bike (MTB) riders participated in the 2nd North Quest Challenge Ladakh 2018 on September 30. 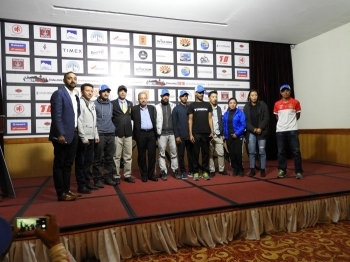 Dorjay Motup, Chief Executive Councilor, LAHDC, Leh in presence of other guest flagged off the cycling race under Elite, Amateur and children categories. Elite riders took six laps of the route which was almost 58 km. Likewise, the Amateur men category had one lap shorter and for women category, it was 3 laps of the route. For children, it was drafted to cover one lap of the route. Wisdom Evento Sports organised the event supported by several corporate houses under the technical guidance of ‘Cycling Federation of India’ (CFI). Harkrat Singh, one of the organisers said, “I am overwhelmed with the turnout. In 2016, the locals did not take part in the MTB as they were very apprehensive about taking part, especially off-road event. Compared to the last event we have witnessed a massive influx of new riders”. He said that it is going to be an annual event during September, as the month gives time to manage traffic and everything and it’s the time when CFI holds most of their MTB events. He also informed that it is the highest accredited MTB race in the world. The other high altitude races are not accredited by any national cycling federation. He later expressed gratitude to LAHDC and other stakeholders for the support in making the event a success. Cash prize by Wisdom, vouchers by Steadfast nutrition, premium watch from Timex and premium bike from Giant Starkeen were also presented to the different winners. Cash prize by Wisdom, vouchers by Steadfast nutrition, premium watch from Timex and premium bike from Giant Starkeen were also presented to the different winners and participants.